III Ultimate Wood Glue, 16 oz. Titebond 1414 - III Ultimate Wood Glue, 16 oz. 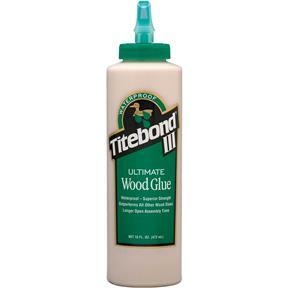 Titebond III Ultimate Wood Glue. An advanced, proprietary technology that offers the best possible performance in woodworking glues. This waterproof formula passes the ANSI/HPVA Type 1 water-resistance specification and offers superior bond strength, longer open assembly time and lower application temperature. Titebond III Ultimate Wood Glue is non-toxic, solvent free and cleans up with water - safer to use than traditional waterproof wood glues. It provides strong initial tack, sands easily without softening and is FDA approved for indirect food contact (cutting boards). The ultimate in wood glues - ideal for both interior and exterior applications. I've been using H6838 III Ultimate Wood Glue, 16 oz. for years, good stuff. I use it for it's slow set up time, gives me a chance to re-adjust thiings and such. Very nice to work with.Good &quot;grab&quot; but leaves you with enough time to position and clamp the wood.Quite water-proof too.Very little odor and excess cleans off with wet paper towel if you do so promptly.